One thing is for sure about carports: they stand out, both aesthetically and in the budget. A carport, more so than a ground-mount or rooftop system, is about making a statement. How big of a statement will be reflected in some significant increases in cost — but this shouldn’t affect the overall value proposition of a well executed carport project. To start, a bare bones carport system will be about 80 cents per watt (compared to an ideal ground-mount system going in at 15 to 25 cents a watt). This low-cost system, according to C.J. Colavito, director of engineering at Standard Solar, will be an exposed galvanized steel structure with no raised collars, an 8-ft, 6-in. clearance and the lightest gauge material that’s still structurally sound, with no snow guards, no lighting, no decking and no water management. Those costs would include delivery, excavation, erection and module mounting. 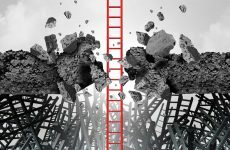 Additional structural and aesthetic choices will drive up costs — the more pimped out, the more costs will go up, reaching $1.50 per watt or more. 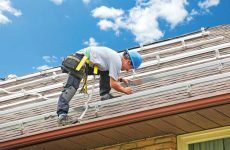 “From the top end carport to the bottom end could be double or triple the cost in dollars per watt,” he says. These are all decisions dictated by the customer, many of whom love the curb appeal and functionality of a standout carport that really becomes an extension of the site’s design, building architecture and company branding. But there are several installation best practices that will improve the delivery and value of a carport project for your customer by reducing the chances of surprise cost escalations. Carports make a ton of sense in two areas in particular: 1) out west, where temperatures are high and shading can be just as valuable as electricity, and 2) the densely populated northeast where swaths of open land are all but gone or will cost a ton to acquire. Plus, local incentives can be a big driver. 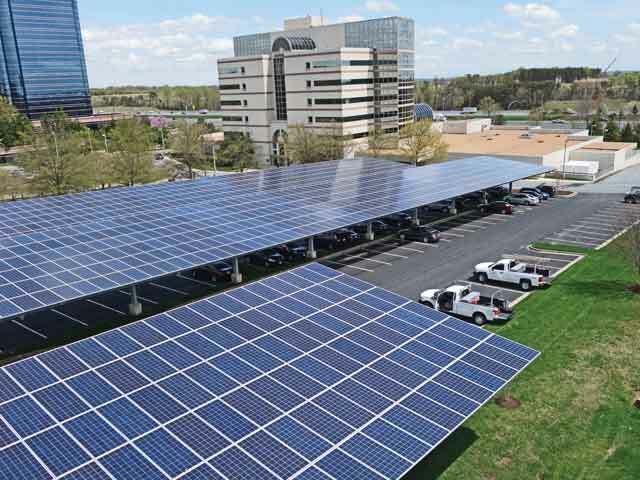 The Maryland Energy Administration, for example, has had a grant program in place for three years offering a certain dollars per watt for supporting deployment of parking canopy systems versus using up valuable green space. Standard Solar is a full-service, vertically integrated developer, EPC and OM provider with aspirations to develop its own fund for financing projects. At the moment, the Standard team connects projects to financing through a network of partners they have worked with in the past. Colavito says the financiers they work with are more interested in the reputation of vendors and material suppliers than ever before, especially when it comes to a carport job. 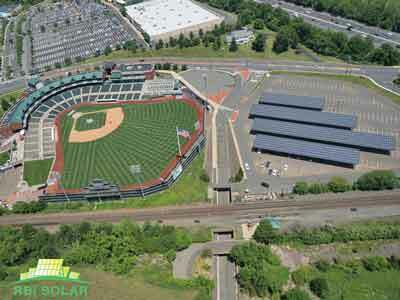 RBI Solar’s CP-P truss design holds up 1,776 solar panels at the TD Bank Ballpark in Bridgewater, N.J. This 515-kW project is part of a Somerset County effort to provide renewable energy sources to businesses and residents. Soil conditions dictate so much about a carport project and can start to really drive up costs, which, again, can just not be afforded with an already costly investment. So, doing all you can to understand and adjust for soil conditions ahead of time is a big win. Soils with 2,000-lbs-per-ft bearing pressure will only need 10-ft foundations at 3-ft diameter with rebar and concrete. But poor or rocky soil can get expensive very quickly. This is why Colavito strongly urged for spending more upfront for quality geotech reports — and a lot of them. The layout of the parking lot is what it is and will dictate a lot of what does and doesn’t work about the project. Making an effort to know all you can about the site before installation will save you time, headaches and money. RBI Solar has a carport solution and is seeing a steady flow of projects these days. In their experience, permitting often causes delays in startup. Site access and project phasing/scheduling are key to creating and maintaining a good work flow. Proper equipment to handle larger structural components is key as well. RBI Solar says staying with consistent geographies can make design, engineering and materials more consistent and cost-effective. Making use of aisle or “T” structures is more cost-effective than perimeter or “L” structures, for example. A successful plan starts with understanding how the parking lot is used — are delivery trucks coming through? Where? What about garbage trucks driving in to empty dumpsters? Do you leave a lane uncovered and shrink the energy footprint of the system or adjust clearance to 14 ft? Also understand the local Authority Having Jurisdiction (AHJ) codes, and how it treats fire access lanes and access to the buildings. Big reminder: Have a detailed survey and a private utility locator. The ground underneath a parking lot is a mine field of every service running to and fro around the parking lot and to the nearby buildings. “We just did a project where there was a 36-in. 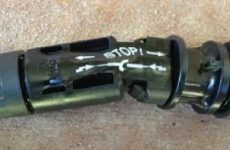 gas pipeline running underneath our customer’s parking lot, and we were supposed to put a couple of array tables there — a couple hundred kW — and we had to eliminate it,” Colavito says. He recommends coordinating your foundations and layout with some cushion, a foot or so from every obstruction, within reason, if you can. This leads right into the structure chosen for the project. Designing the system to have some cushion and adjustability will require a structure that allows for that on-the-fly flexibility. Slack says RBI Solar’s carport solutions are flexible and cost efficient. Along with its in-house design and engineering, they help contractors evaluate site layouts and develop a solution that is most efficient for the project. “We optimize our structural design to manage not only structure costs, but overall project costs, which is key to a successful installation,” Slack says. “Our structures do not require field welding and are shipped ready to erect and bolt together in the field. Our installation crews and in-house project management are there to ensure successful construction of the carport structure. Another solution that can help minimize costs for certain projects is a structure with longer spans. Most posts are 20 to 30 ft apart, so about every other parking space, but some longer span systems can go about 40 to 50 ft.
Be sure to work with a supplier you can trust and closely manage construction. Colavito notes that an underrated part of carport aesthetics is quality workmanship. How well are modules mounted? Are they aligned? Any novice can look up getting out of their car and notice weird alignment issues, or a bunch of sloppy-looking wire hanging everywhere and just assume someone messed up. Suddenly, this multimillion-dollar project looks like it was slapped together. “Aesthetics do run the full range depending on options, but you can make the base model stuff look pretty good,” Colavito says.